Our most recent poll has closed and most people voted that 2008 was a good or great year. A few of you apparently not so lucky readers didn't have a particularly good year but overall the results were positive. One of my favorite responses to that poll came from my buddy Trey who said it was his best year because he learned to fly fish in 2008. Now that's a great year in anybodies book if you ask me. To me, 2008 was great for several reasons. First, I expanded my horizons and explored some more. 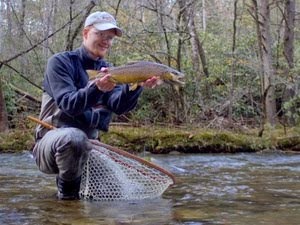 I caught several new species on the fly rod and chased the mythical lake run fish on the south side of the Smokies, finally finding a few good fish. One of the major highlights of the year was the opportunity to work at Little River Outfitters which was a dream come true. Talking with customers and helping them have a great time while visiting the Smokies was a lot of fun. It was always gratifying when someone would stop back by to say thank you for the information that led to some nice fish. The year was also great because the Caney Fork River continues to improve despite enormous fishing pressure. This river has become one of the top rivers in the southeast but unfortunately this has created some serious crowding problems. While it will still fish well this next year, it will probably not be the river of choice for many people, myself included because of the bad crowds. Still, I'll get my fair share of time on that river which will always be my favorite Tennessee tailwater. Currently I'm setting at 20 days without wetting a line and I'm really starting to have some withdrawals. Last weekend wasn't too bad since I did get to spend Sunday tying at Little River Outfitters which is probably the next best thing to going fishing. However, the lack of fishing is really starting to hurt so I felt like it was a good time to continue my 2008 Year in Review posts. As the early months gave way to the warmer weather of spring, the fishing just kept improving. Early on, I focused largely on the Tennessee River, especially just below Chickamauga dam where the fishing was often exceptional for white bass and hybrids. As the weather warmed, the skipjack started running and provided a lot of fun on the fly rod. These fish are called Tennessee Tarpon for a reason and absolutely go crazy when hooked. The other big moment below Chickamauga came when I caught my first ever double on the fly. Hopefully I'll do it with trout this year but until then, its hard to beat these two nice fish. I also took several trips to the Smokies including a great one on April Fool's. It turned out that the fish were the foolish ones and I managed several beautiful wild rainbows. In May, things went from good to great when I received a phone call from Little River Outfitters in Townsend inquiring whether I would be interested in working for them over the summer. I would have been crazy to say no and before I knew it I was busy at an awesome summer job (as long as I overlook Wapsi Hell that is). The best thing about this was that I could fish every evening in the Smokies if I wanted which I generally did. Another big first occurred when I caught my first Caney Fork slam of a rainbow, brown, and brook trout. TWRA began stocking brookies on the Caney this past year and so far the results are promising. I'm willing to bet that we start seeing some 16-18" brook trout this next year. The Caney Fork has a lot of food available for the trout and the fish in that river grow very quickly. By fall of 2008 a few brookies were already pushing 13-14" so 2009 should be epic. 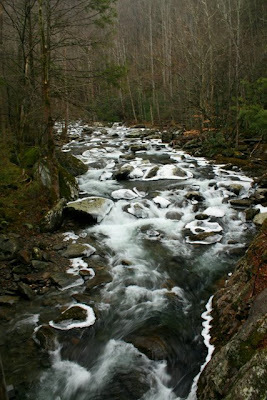 The big story in the Smokies that became apparent by early summer was that the ongoing drought had not given up yet. The streams were frighteningly low by June although we did see a few rounds of thunderstorms over the summer which helped a bit. I've finally got around to posting the promised pictures from this past weekend. 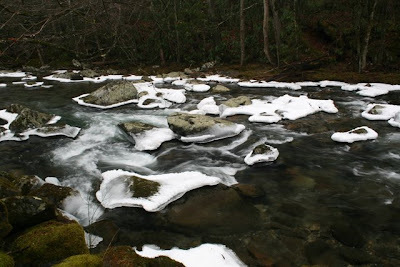 The cold weather we've had lately froze a lot of the flowing water here in Tennessee. 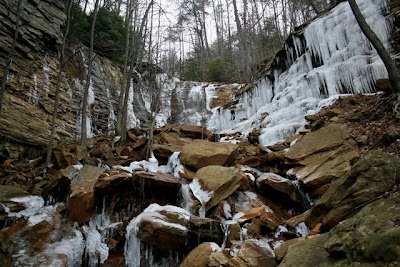 On Saturday afternoon, I went hiking near Chattanooga in search of some frozen waterfalls and found some spectacular ice formations. Despite the frigid conditions, I managed to have a good time and stay relatively warm. 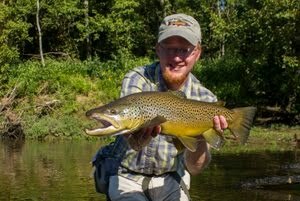 On Sunday, before the tying demo at Little River Outfitters, I drove up to Tremont and took a few pictures. 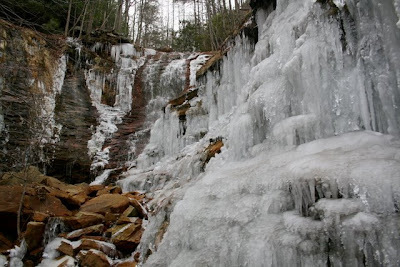 Most of the rocks in the Middle Prong had varying amounts of ice on them... Below are a few pictures. 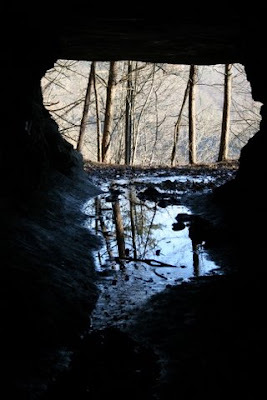 The first two were taken in a canyon near Chattanooga, Tennessee and the rest were taken on the Middle Prong of Little River in the Great Smoky Mountains. Yet another great weekend is in the books but still no fishing. Lately the Caney is showing signs of slowing generation which is a good thing. Unfortunately (or fortunately depending on your viewpoint), the extended forecast includes several chances of precipitation. Thankfully as of now, none of these are looking like the significant events we experienced over the last several weeks. With any luck I'll be fishing on the Caney in another couple of weeks. Despite the lack of fishing, I still had fun this weekend. Saturday I got in some hiking and the chance to get outside with friends and take a few pictures was great! Today (Sunday) I spent several hours at Little River Outfitters doing a fly tying demo. As always, it was a lot of fun to just hang around a good fly shop and talk fishing. Tying flies wasn't bad either. I shared a few favorite Smokies patterns including one of my "secret" soft hackles that the browns just love. When most people think about fly fishing, they envision a cool mountain stream or a large western river with someone artistically working a fly rod for rising trout. 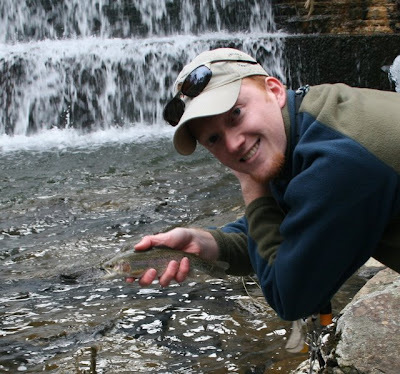 Many fly fishers consider the dry fly as the purest approach one could take to the sport. Casting a dry over a rising trout and watching the take is indeed one of the most exhilarating moments you can experience on the water. 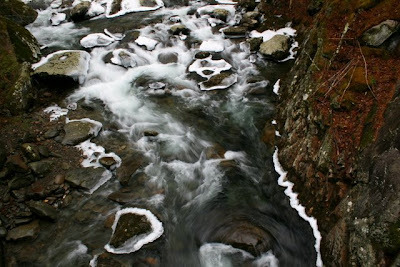 However, if you want to be successful as a fisherman, you must be able to adapt to whatever conditions are occurring when you arrive streamside. Anyone that has fly fished for any length of time has heard the saying that 10% of fisherman catch 90% of the fish and most likely everyone has also heard that trout feed below the surface 90% of the time. Becoming proficient with subsurface flies is critical to success as a fly fisher. 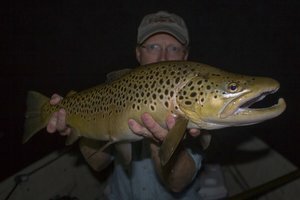 While we often focus on the more exciting mayflies, caddisflies, and stoneflies, there are other insects that are important to trout. Midges are often one of the dominant food sources for trout and carrying a broad selection of patterns to cover these insects will contribute to many successful outings if one knows how to fish them properly. Some of the easiest flies to tie will often catch the most fish in a trout stream. The only downside to tying midge patterns is their normally small size in relation to other fly patterns. I regularly tie and fish patterns from a #18 down to a #22 but will fish down to a size #28 or even #30 as the conditions dictate. 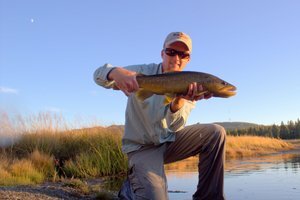 Those that regularly read this blog or fish with me know that I like fishing with multiple flies to increase the odds. Better yet, it helps in determining what the fish are feeding on. I can try one fly at a time or I can try 2-3 flies at a time. Obviously I can try many more patterns in an hour if I tie on twice as many each time I change. When fishing midges, I like to also fish something larger to serve as an attractor and then drop my small midge pattern behind the larger fly. It is important to either match the larger fly to food that is commonly available in the water you are fishing or to an attractor pattern that normally does well in that particular river. When fishing a tailwater, I will often use a scud or sowbug pattern as the first fly. Other good patterns are Pheasant Tail Nymphs, Copper Johns, and various softhackles. On tailwaters where there is a good population of a specific mayfly, caddis, or stonefly, I'll often fish a nymph or larval immitation of the prevalent insect. Always use the heaviest tippet you can get away with for the first fly in a multiple fly rig. Tying on several flies can take a few minutes if you aren't very quick with knots, and it is always frustrating to lose the whole rig. In most situations 4x tippet is fine and if at all possible, don't go below 5x. People are often shocked at how heavy of a tippet you can get away with even on pressured fish. Using fluorocarbon will allow you to use heavier tippet. Once you have chosen the first fly, it is time to figure out what type of midge pattern to fish. You want to use a fly that matches the larva or pupa that are most common in the water you are fishing. Before choosing a fly, take a moment to observe the water and see if you can figure out what the trout want. Are they staying right on the bottom, betraying themselves only by the occasional flashing side? Or are they up in the water column moving around as they intercept midge pupa in the drift? For fish that are up in the water column, a pupa will be the best immitation while for those right on the bottom, a larva will often catch more fish. When it comes to midges, one mistake that many people make is to fish patterns that are too fat. Traditional wisdom says that midge larva are long and slender while the pupa are short and stout. This is true but short and stout is definitely relative. Most midge patterns that are supposed to be pupa are much too fat compared to the naturals. Often the fish won't seem to care much but at other times, fishing a less bulky pattern will bring a marked increase in the number of hookups. I have several patterns that I like to fish. The zebra midge in various color combinations is a reliable fly that can catch at least a few fish under most circumstances. I tie mine with a slimmer profile compared to those that many people fish. Other favorites include the RS2, WD-40, various thread midges, and patterns made from micro and midge tubing. Midge larva or pupa tied using midge and micro tubing are easily some of the most realistic small flies I've ever fished. 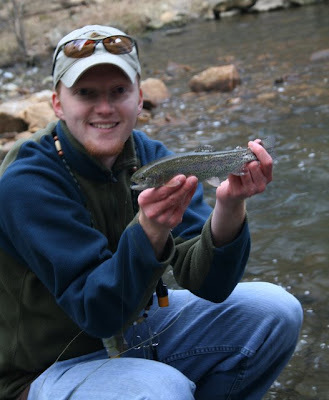 This point was driven home one day while fishing the Roaring Fork River in Colorado. This Gold Medal stream is known for its fine brown trout but the section we were fishing was some of the better rainbow water on the river. In one particular hole, I sight fished to a large rainbow using a tiny gray midge larva dropped behind a Green Drake nymph. After several drifts, the large rainbow ate and upon feeling the sting of the hook, immediately raced to the middle of the river before jumping. 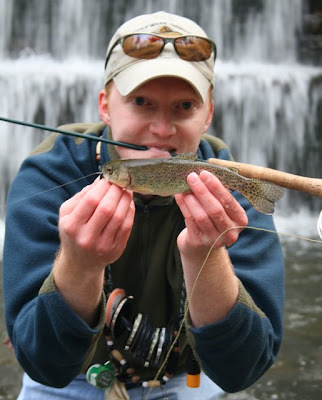 When I saw the size of the fish I was immediately worried about everything, the tippet, the tiny fly that connected me to the fish, and the fast water just below the pool. Sadly the fish raced downstream and 10 minutes later the nice rainbow won the battle when the small fly popped free. I now knew that the fish really did like my midge pattern but I was fully convinced after fishing another pool. After covering all the likely water, I pulled my flies in to make sure everything was intact. When I saw the midge, I was shocked to see a small gray midge larva the exact same color and size as the fly I was fishing. In fact, it looked so identical that my fly could have been a natural threaded onto the hook. 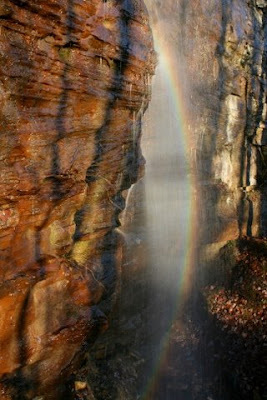 It was now obvious why the large rainbow had been so easily fooled in this highly pressured water. The first time I learned of this fly was from east Tennessee guide Hugh Hartsell. He shared the pattern with me as a good match for blackfly larva. While fishing out West in the nutrient rich tailwaters, I discovered the need for a really good larva pattern and remembered my blackfly patterns. While fishing the Gunnison River I pulled one out and after a small of modification was soon catching lots of large and now stupid trout. The next day my buddy and I headed down to the nearest fly shop to pick up some more micro tubing. Back in camp, I tied around 20 or so of the flies in different colors and headed back to the river. 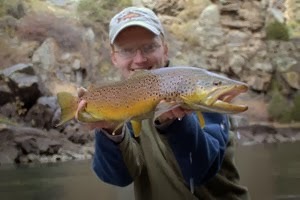 This fly became a staple on the Gunnison and proved itself on several other waters as well. Select the appropriate size of tubing based on the size of fly you are tying. I tie most of mine with Micro Tubing but for larger sizes midge tubing is great as well. Midge tubing will work down to a #22 or #24 but the Micro Tubing will cover all situations. To tie the pattern, tie in your thread about halfway back on the hook shank (#24 TMC 2487 shown with gray thread). Wind the thread back towards the bend of the hook and tie in the midge or micro tubing on top of the shank (shown with gray micro tubing). After securing the tubing, wind the thread evenly to just behind the hook eye. Wind the tubing forward keeping the wraps tight up against each other. If you leave the first few wraps a bit loose, it will simulate the slightly thicker half that most larva have. Start putting more pressure on the tubing and it will stretch, creating a nice thin and perfectly segmented body. Once you wrap the tubing to just behind the eye, tie it off with a couple wraps of thread. Give two more wraps of thread and finish the fly in whichever way you prefer. I normally just use 3-4 half hitches and a bit of glue. The last of the precipitation departed yesterday morning as a few lingering snow showers moved through east Tennessee. The snow was in no way significant with this last weather system but the rain was. Center Hill Lake, below which is the Caney Fork tailwater, rose a few feet as a result of all the rain we got. It looks like the generation will continue heavily there for awhile anyway. 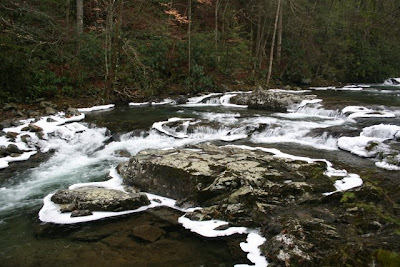 In the Smokies, Little River rose higher than it has been in a long time. 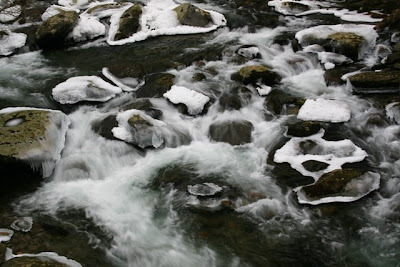 I have not been able to get over to the Smokies recently so I don't have any pictures of the high water. 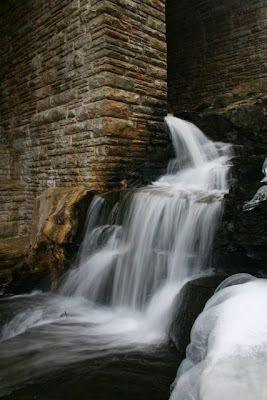 However Ian Rutter from R and R Fly Fishing posted some excellent pictures taken during the high water episode. 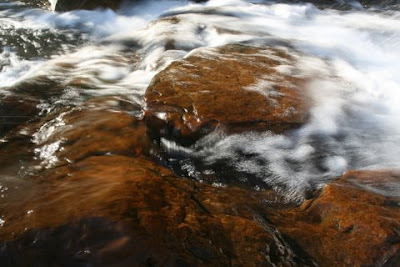 One of the most impressive was of Little River at the Sinks. The water was extremely high and dangerous. While it has been bad for fishing in the short term, all this rain is pulling us out of the drought that we have been in for the past 2 years so most of us are glad to see it. Partly because of all the rain and partly because I've been busy, I haven't been fishing as much lately. My new teaching job started this past week and is keeping my doing things other than fishing but I should be able to start fishing on the weekends again soon. So you don't get too bored until I fish again, I'll be posting another article on midges in the next day or two...maybe even later this afternoon. In early December I posted a video on midges from Ralph and Lisa Cutter. In the past I have posted on how to fish the Zebra Midge most effectively so I won't be dwelling much on these techniques either. The main focus of the upcoming article will be on fishing midges in deeper water in tandem with other flies and will include some of my favorite flies for this task. I'll cover how to rig up, tips on casting, and even a recipe or two for some of the easiest midges you will ever tie. If you have any questions that you would like for me to address, please post them here under the Comments section or shoot me an email and I'll do my best to include them in the article... I also still owe you the 2008 Year in Review so look for that in the near future as well! Just when the Caney has had a few very short windows without generation, it looks like we will be getting a lot more rain. If the current forecast holds true (does it ever though? ), the Caney could be generating until February. Of course I can't be complaining because all the rain does have a silver lining. First, the fish in the river will be relatively untouched as long as the generation remains heavy. In other words, when they finally quit generating for awhile, head for the river as soon as possible. Second, it looks like we are just about out of the drought conditions so bring on the rain! RUNOFF FROM THIS RAINFALL COULD POSSIBLY LEAD TO FLOODING OF AREA CREEKS AND STREAMS ON TUESDAY...WITH FLOODING OF LARGER RIVERS BY TUESDAY NIGHT. THIS INCLUDES RIVERS AND TRIBUTARIES IN THE DUCK...ELK...BUFFALO...STONES...CANEY FORK...AND HARPETH RIVER BASINS...AND OTHERS THAT DRAIN INTO THE CUMBERLAND AND TENNESSEE RIVERS.